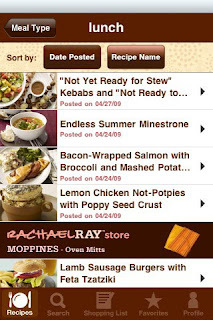 Everything Rachael Ray: Rachael Ray Finally Has an iPhone App! 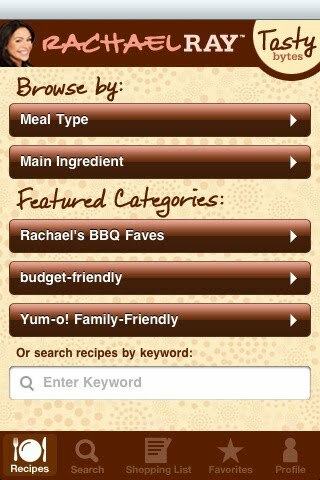 Rachael Ray Finally Has an iPhone App! Planning a party or a special dinner? 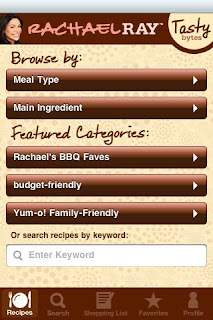 Mark the recipes you want added to your Shopping List. 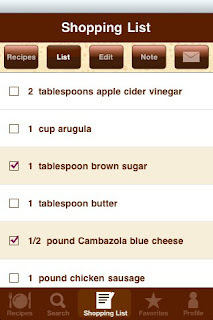 Your Shopping List will combine the recipes and give you one list to take to the market. You can mark off items on the phone as you add them to your cart and make notes on any additional goodies you want to pick up while you're out shopping. It will make entertaining a breeze! Email recipes or your Shopping List to yourself so you can print it out for a printed backup copy. Every recipe has a delicious drink pairing. Easy to use search tool. Choose your favorite recipes and store them in a folder. Sign me up! It also gets great reviews from the few customers who have left them. At only 1.99, this seems like a great bargain to me.